Russia is to send new anti-aircraft missiles to Syria, a week after Syrian forces accidentally shot down a Russian aircraft during an Israeli air strike. 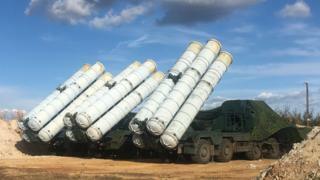 The S-300 missile defence system will be delivered within two weeks. The Russian reconnaissance plane was downed last Monday after Israeli jets attacked targets in Latakia province. Israel, which insisted Syria's military was to blame, warned that giving the S-300 to "irresponsible actors" would make the region more dangerous. US national security adviser John Bolton said the decision would cause a "significant escalation" in Syria's civil war and urged Russia to reconsider. Russia has an airbase in Syria from which it carries out air strikes in support of President Bashar al-Assad's forces. Russian Defence Minister Sergei Shoigu said the delivery of the S-300 system had been suspended in 2013 following a request from Israel but added: "Now, the situation has changed. And it's not our fault." "In parts of the Mediterranean adjacent to Syria, there will be radio-electronic jamming of satellite navigation, onboard radars and communications systems used by military aircraft attacking targets in Syrian territory," he said. The Ilyushin Il-20 is reported to have been downed about 35km (22 miles) from the Syrian coast as it was returning to Russia's Hmeimim airbase near the north-western city of Latakia. Russia's Tass news agency said at the time that the plane had "disappeared during an attack by four Israeli F-16 jets on Syrian facilities in Latakia province". Syrian television also reported explosions over the sky in Latakia just before 22:00 local time. Thirty minutes later, the Sana Facebook page reported that Syrian air defences had responded to enemy missiles. On Sunday, Russia reiterated its stance that Israeli jets had used its reconnaissance plane as cover while carrying out strikes in Syria. The country's defence ministry said Israel had failed to give it adequate notice of the attack, putting the Russian aircraft in the path of Syrian air defence systems. "The actions of the Israeli fighter pilots, which resulted in the loss of life of 15 Russian servicemen, either lacked professionalism or were an act of criminal negligence, to say the least," a ministry spokesman said. President Vladimir Putin told Israeli Prime Minister Benjamin Netanyahu by telephone on Monday that the decision to strengthen Syria's air defences was "primarily intended to thwart any potential threat to the lives of the Russian military service members", the Kremlin said. The Lebanese Shia Muslim militant group and Iran are both allies of the Syrian government. Is Russia taking over Syria's air defences? In striking at targets close to the Russian air base near Latakia, the Israeli Air Force appears to have crossed a Russian red line. Furthermore the loss of its aircraft has compelled Moscow to act. But its intentions remain unclear. Israel insists that interrupting weapons supplies to Hezbollah and constraining Iran's growing influence in Syria are vital strategic goals. But Russia seems to be saying it is no longer willing to turn a blind eye to such operations, which it believes are weakening the Syrian leader, President Assad. If this really is Moscow's intention then the Israelis are going to have to tread carefully. There could be some very tense and bumpy moments in the coming weeks and months.